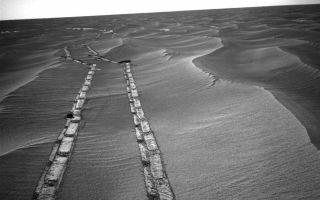 In this space wallpaper,Rover makes progress on long trek to Endeavour Crater.NASA's Mars Exploration Rover Opportunity used its navigation camera for this northward view of tracks the rover left on a drive from one energy-favorable position on the northern end of a sand ripple to another. The rover team calls this strategy hopping from lily pad to lily pad. Opportunity took this image on the 2,235th Martian day, or sol, of the rover's mission on Mars (May 8, 2010). The tracks are from a 14.87-meter (49-foot) drive southward on the preceding sol. Mars' southern hemisphere was in the minimal sunshine period close to the winter solstice, which occurred May 13, 2010 (Universal Time).